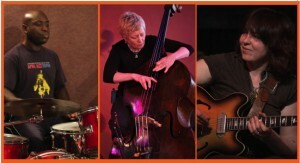 My jazz guitar trio with Alison Rayner (bass) and Winston Clifford (drums). Swing, bebop and funk ? a jazz extravaganza built from scratch. Jan?s was originally a pub called The Cricketers. It?s now a Flemish style bar specialising in bottled beers. It?s right on Stoke Newington Common almost next to the Sunstone Gym.